Discount chain Filene's Basement has filed for Chapter 11 bankruptcy protection, the Times reported. It was the second time the deep-discount specialist filed for bankruptcy in 10 years, according to the report. "Legendary bargains were not enough to keep the troubled chain going ... While discount chains have performed far better than their upscale peers in this recession, Filene’s got hammered by much lower-price chains as well as by high-end chains like Saks and Neiman Marcus, which suddenly began offering the latest designer fashions at deep discounts." Sales flagged at new stores and other discounters like TJ Maxx and Century 21 stepped up the competition, causing Filene's to put 17 of its 25 stores up for sale, the Times reported. That includes the century-old retailer's Boston flagship store. Filene's estimated it had up to $100 million in assets and as much as $500 in liabilities. The 17 stores are likely to be bought by Crown Acquisitions for $22 million, the Times reported. 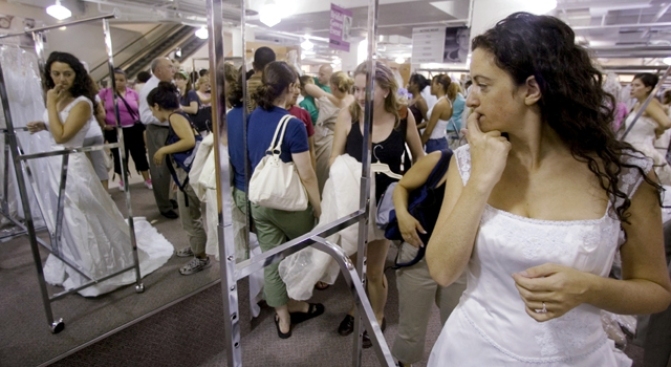 Filene's is famous in part for its "Running of the Brides," a periodic sale on high-end wedding gowns, causing brides-to-be to drive several hours to the nearest store and camp out overnight, hoping to get the deal of a lifetime, if not an interview with the news crews that always show up.